We have featured photo/scans from the 1937 book “California of the Southland” published back then by the UCLA alumni assn. 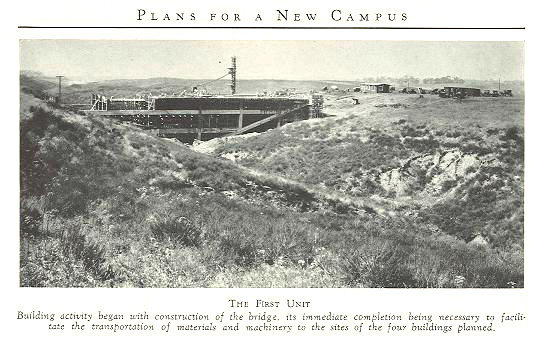 The book notes that the bridge in central campus over the ravine had to be built early as the initial campus construction got underway to facilitate transport of needed materials. The ravine was later filled in but the bridge remains, although it appears to be an ordinary surface road. Previous Previous post: Riddle: Why is a MOOC like the Bay Bridge?